Enjoy Zip-Lining at Dreams Los Cabos! Our gem of the Pacific, Dreams Los Cabos Suites Golf Resort & Spa, is now offering adventure lovers an exclusive new zip-lining package! When you reserve the “Vacation Adventure Package” upon booking any Preferred Club room category, every guest in your room will receive one zip-lining activity at Wild Canyon Adventures in Cabo San Lucas! Zip-lining adventures should be arranged with the hotel concierge prior to arrival at concierge.drelc@dreamsresorts.com. And the young ones can participate too – for ages 8 and up! Stay a minimum of 4 nights in order to be eligible for this package. Book by October 31st, and travel between May 1st and October 31st! And don’t forget about our Complimentary Greens Fees offer! Guests who stay in any Preferred Club room category will receive one complimentary round of golf at Cabo Real Golf Course or Club Campestre San Jose Golf Course per person, per room. What are you waiting for?! Book your stay today! And don’t forget to stay connected with us on social media to learn more about what’s happening at Dreams Los Cabos. This entry was posted in Dreams Los Cabos. Bookmark the permalink. 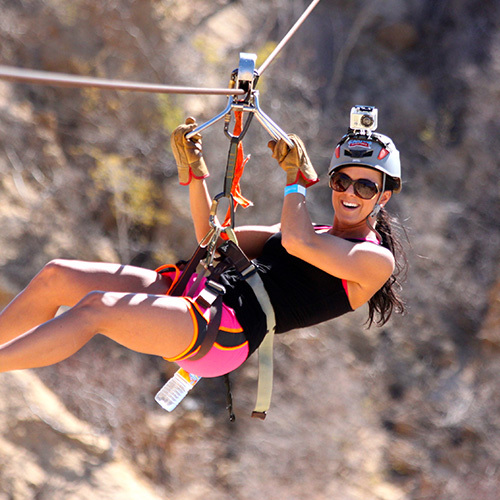 Pingback: Vacation Adventure Package: Hotel + Zipline | Wild Canyon Adventures | The best adventure park in Los Cabos. Pingback: Vacation Adventure Package: Hotel + Tirolesa | Wild Canyon Adventures | El mejor parque de Aventura en Los Cabos! Pingback: Vacation Adventure Package: Hotel + Zipline | Wild Canyon Adventures | The best tours and activities in Los Cabos.